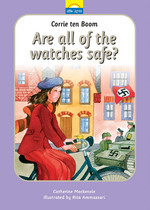 Tells the true story of Corrie Ten Boom and little Dutch watch shop. While she mends watches she is constantly watching out for danger to ensure that her friends in the secret room are safe. Tells the story of God who is the only one who can keep us safe.